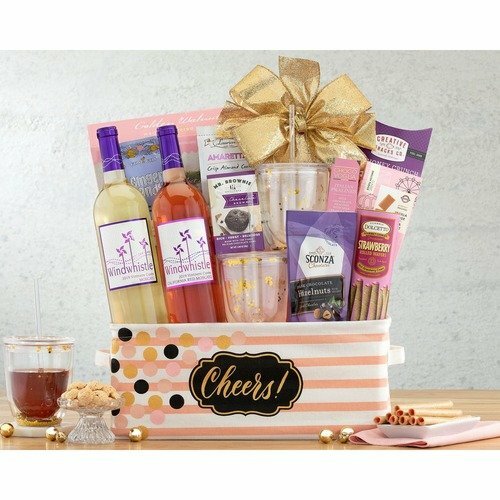 A duet of sweet wine, Windwhistle moscato and red moscato, and a large collection of chocolate, cookies, crackers, wine stopper, two double-walled, plastic wine glasses and so much more fill this fun colorful basket. 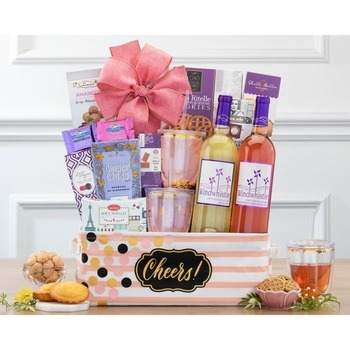 * Have used 1st In Flowers for many years to send a gift of flowers to Portland OR from Northern Ireland and have always found the service not only 1st for flowers but also 1st in service and delivery. Thank you for giving such a great service. * Knowing we can send flowers to our loved ones in Europe is such a comfort! 1st in Flowers made our day.